Notice there’s the slightest of gaps between the panels and the roof shingles. We had a south-facing lot, which the HOA didn’t want. We wanted to install a lot of panels, which the HOA didn’t want. It seemed like we were in a no-win scenario. 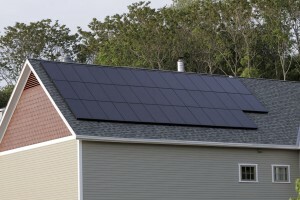 That is until I recently came across a type of solar panel that installed like a roofing shingle, completely flush with the roof and extremely dark in color all around. The solar panel is about halfway up the porch overhang. So instead of installing a whole-house system, the initiative morphed into a emergency power plant. First, I installed one 144-Watt Uni-solar thin-film panel and ran the lines to a small grid-tie inverter, which started putting power back on to the grid through a standard wall outlet. I measure the power input through a standard Kill-A-Watt outlet power meter. 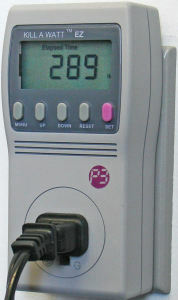 Most people use it to measure the power draw that certain appliances use, but the standard Kill-A-Watt meter is also bi-directional. After putting a little chunk of power back on to the grid, I added a small 10-Amp MPPT charge controller to the circuit via parallel wiring to charge the emergency backup batteries I was going to use in this system. Little did I realize that this would be the most expensive part of the system. I bought some huge deep-cycle AGM batteries, hooked them up to the charge controller in a 12-volt parallel array and finally had a small power plant that could run the refrigerator or furnace for a few days. At the very least, this whole project gave me a big appreciation and better understanding of how solar power works. With this setup, my solar panels will keep the emergency batteries charged, and any excess juice will go directly back onto the grid. I did not go with a net metering service from the local power company because I would’ve been charged $4 a month just to use the service, and my system was not powerful enough to make it worth it. As long as you are never generating more power than you are currently consuming (and I easily consume 144 Watts at all times of the day), it makes no sense to install a net meter because your in-home appliances will consume that extra energy before it goes out onto the grid. Have a question about my setup or other learnings? How about MPPT vs PWM charge controllers? Or standard lead-acid vs. AGM batteries? Leave me a comment below and I’ll be happy to answer whatever I can. Is it possible to power the refrigerator and furnace that you mentioned when the power goes out? Do you have a separate inverter for that? Yes, I have a separate power inverter I can activate to directly power the furnace/refrigerator If the power goes out. It’s not automatic switchover, but it works well enough for my purposes. Last I had heard you were at the no-win situation. So glad you found a solution! Fun to read about. Yeah… that’s probably how I would do it too. If I’m looking at the right battery, it seems like it can deliver about (12v * 155Ah) = 1860W*h. Maybe enough for 10-30 minutes on an electric furnace. Does that sound right? You could probably keep a refrigerator/freezer running for quite a while. Chris, to clarify, it’s meant to run the blower on my gas furnace when the power goes out. From what I can tell, this system could run the blower for a very long time. what was the cost you estimated for the full house system your HOA denied? I’m really curious about that. 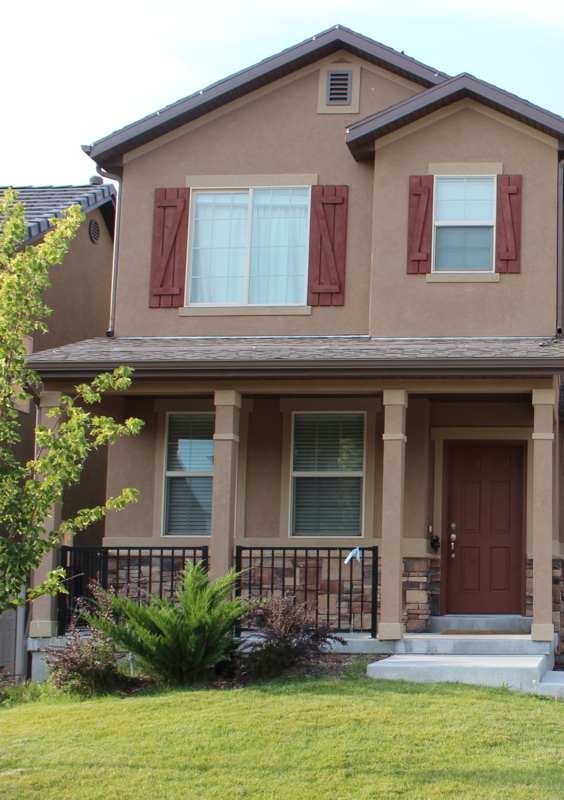 I don’t have an HOA right now…but I think I might in the next few years! About $23k total before the federal and state tax credits (which help saves about 33%). really?? hmm….that’s a lot less than I thought. We only needed a 5kW system for our needs. Your mileage may vary. This is really intriguing. Do you have any ballpark estimate on what you’ll end up saving per month, and does the power company just give you a credit for what goes back into the grid? If I had gone with a full house system, I would’ve immediately saved 30% on my normal power bill until the system was paid off. Then it would’ve been all positive gains from there. However, since I went with only an emergency backup system, I will only save a small amount of money on the monthly bill. Most power companies just credit you for whatever ends up on the grid. Interesting…I literally just bought a house yesterday, and I keep finding myself pondering a solar panel setup haha…maybe a similar setup would be a good starting point. 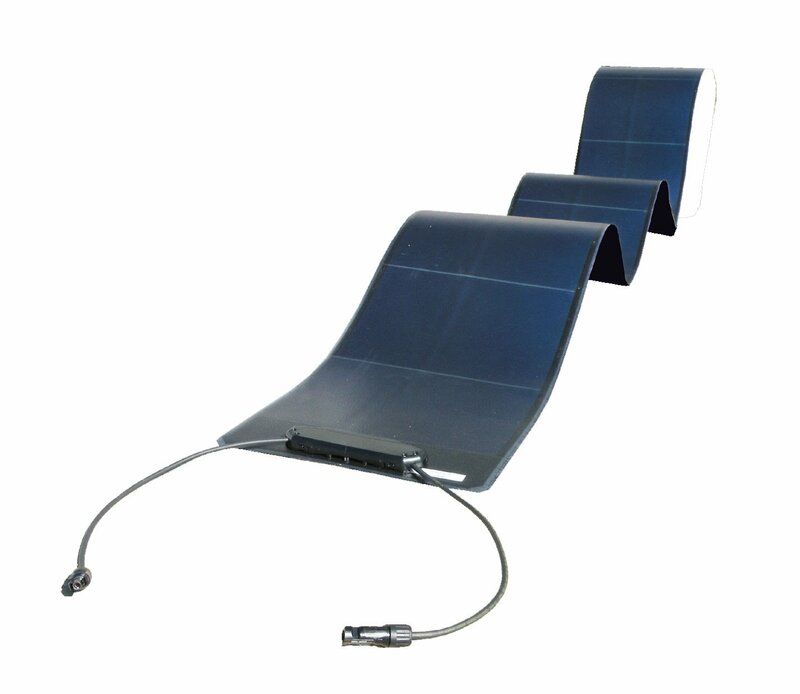 Where did you buy your 115 W flex solar panels? I bought some at a garage sale and cant find the manufacturer nor the wattage. But they look just like the one in your picture. My panels are each 4 ft wide and 18 foot long.